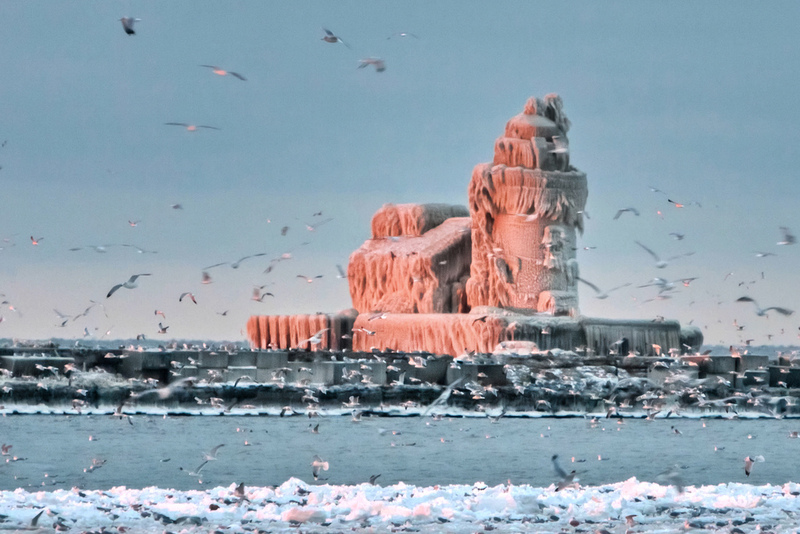 Today’s photo of the West Pier Lighthouse that’s encased in ice was taken last winter from Whiskey Island. It reminds me of something out of a Dr. Seuss book. Constructed in 1911, the lighthouse was automated in 1965 and still flashes its beacon to alert ships every five seconds. The original Fresnel lens in now on exhibit at the nearby Great Lakes Science Center. This entry was posted on Monday, January 2nd, 2012 at 9:47 am. You can follow any responses to this entry through the RSS 2.0 feed. You can leave a response, or trackback from your own site. This photo is amazing! It looks almost like a cake. I do have a few that are for sale.